This is one of the most common questions Melbourne Pack Coach Sean Williams gets asked as a distance running coach. To address this, Melbourne Pack interviewed Magnus Michelsson. Not only is Magnus the husband of Melbourne Pack standout athlete Susan Michelsson, he is also an endurance running Legend in his own right. And we don’t use the term ‘Legend’ loosely! He ran his first marathon in 1985 at the age of 17 in 2:40. In 1988 he was 87th at the Hawaii Ironman – the youngest competitor in the top 100. A successful career in triathlon followed, but he eventually switched back to the marathon in the leadup to the Sydney Olympics because he ‘thought that it would be easier to make the marathon team than the triathlon team’. His half marathon personal best is 62:52, and his marathon personal best is 2:13.59; he has twice won the Melbourne and Canberra marathons, and has also won the Gold Coast Marathon. In 2012 at Ironman Melbourne his 2.50 for the marathon was the fastest Ironman age group time for ALL age groups for the whole year. His Melbourne Marathon winning margin in 2003 is the biggest male winning margin in the history of the race. He has completed 11 Comrades marathons, finishing as high as 16th in a time of 5:55.28. 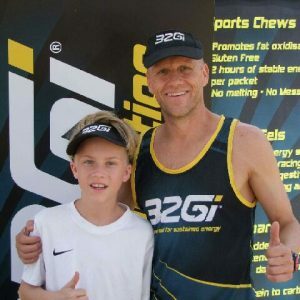 It was racing at Comrades in South Africa that ultimately led to his new profession of representing and distributing the 32Gi brand of sports nutrition in Australia, as this is where he first discovered the company and its products. At 49, he is currently training for the Busselton Ironman, and so endurance fuelling is an everyday reality for him. Melbourne Pack: Why did you choose to support and promote 32Gi Sports Nutrition? MM: I had been playing around for years with different nutrition products and I was really not that happy with them. For example, when I ran 2:13 for the marathon I had a lolly snake at 30k and had the sports drink on the course. However as race distances got further, nutrition fuelling became more important. In 2008 I discovered the 32gi Endure product and that worked really well for me for the 89k Comrades Marathon– it raised my blood sugar slightly but for a really long time. I have since found out that it is even safe for diabetics and kids because it does not give you a sugar spike. When I first tried 32Gi Endure for a marathon I actually fuelled myself too much; the newer Race product would have been a better choice. Now that I run around 3 hours for the marathon Endure is ok. It really depends on what speed you are running and how quickly you are burning those calories. Melbourne Pack: What is your biggest tip for endurance athletes with regard to what they consume before and during races? MM: Find something that works for you. Try lots of things first and then stick with something that works; as people react differently to individual products. As well, what works for one distance for you may not work the same for other distances. For example, if you are doing a race such as the 89k Comrades Marathon, you might have something more substantial such as ‘chews’, and I even know someone who used the Recovery Protein drink during this race. 32Gi Low Gi Chews are a bit like a lolly snake. The bar has 4 sections, so you can eat a quarter at a time. They do not melt, even in extreme heat, and are designed to give two hours of stable energy. They are equivalent to 2 small bananas or potatoes in sugar response and calories, and are easy to chew and swallow, which are your primary concerns for fuelling while racing. 32Gi Recover is a unique vegetable protein recovery formula using a 1:3 PROTEIN to CARBOHYDRATE ratio. The 3:1 carbohydrate to protein ratio can assist in delaying the onset of muscle fatigue during high intensity exercise. So with the protein it is not something usually used for racing, but this person found that it worked for him. Once again the key is to find out what works for you. In 2012 when I ran 2.50 for the Marathon as part of the Ironman at age 44, I used four bottles of 32Gi Endure on the bike, 2 bottles of 32Gi Endure on the run, and the tabs. I was using these products long before I started selling them. Melbourne Pack: What are the biggest mistakes that you see athletes make? MM: Not doing enough training, especially for the relatively shorter races. If you feel that you have to have a gel during a 1 hour race then you probably have not trained enough for that race. I consider shorter races those less than an hour and all you would need is water. I actually see people over-consume calories when racing and/or training. A lot of the gels in the marketplace are so high in sugar that you have to consume them every approximately every 20 minutes so that you don’t get the sugar drop – and the athletes can be consuming more calories than they are burning. This is definitely not what you want if you are trying to reach your ideal racing and training weight. I think sometimes people are having something for ‘psychology’ – they want to consume something but they really don’t need it. You do need something if you are racing over two hours. But then again, you need to do a lot of training to get in good enough shape to not need anything over a two hour race. Melbourne Pack: What are your specific tips for fuelling for the marathon? 1. Once you have worked out what works for you, work out how many calories you need for the entire race and budget your calorie allotment accordingly. 2. If you can’t get 32Gi on the course, then you can use the tabs – keep them in foil, chew and have with water and it is just like having a sports drink. A 32Gi chew and the race drink is usually good for people running their marathons in the 2.30 range. 3. I also recommend the 32i Endure drink because the slow burning carbohydrates without the sugar. 4. Another option is the 32Gi gels which are rice malt syrop, which doesnot give you a sugar spike. Experiment in training with how often you need those. 5. For the Half marathon – use 32Gi gels or race drink – or nothing! 6. If doing an Ultramaraton: use 32Gi chews and 32Gi Endure Drink and 32Gi Race Drink.